Create a business plan that provides guidelines for each stage of business development. Cyber, or Internet, cafes are a gathering place for those who want to check email, chat online, play online and offline games or for those who just want to meet friends in a casual atmosphere. 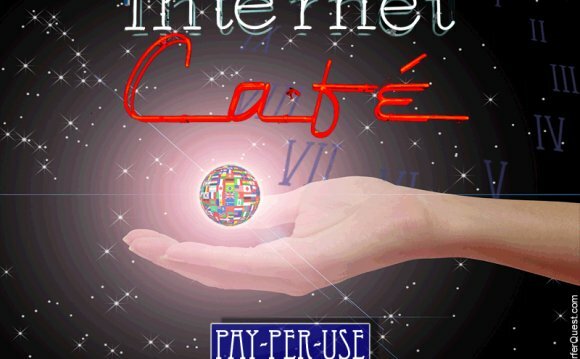 Cybercafes typically offer food and drinks to increase profits and to create a meeting place that customers want to return to. Providing a safe place for people to use the computer may lead to a profitable business. Create a business plan for your cybercafe. In the first section, outline the types of computer services and food and drink items to offer customers. Next, linventory equipment and startup costs, business insurance and permits needed. In the third section, record ways to market your cybercafe and catalog all managerial and employee duties in the fourth section. Register the business with your secretary of state's office. You may need to register the business with the county clerk's office in your county. Apply for a business license through the county clerk's office or by contacting your local small business administration office. Apply for an employer identification number (EIN) provided by the IRS. Include this number on all state and federal tax return forms. Apply for a sales tax license from your state's department of revenue to accept sale tax from services and food and drink provided at your cybercafe. Purchase business insurance. Business insurance may include property, product and general liability to help cover the costs of damage to property, computer equipment or costs associated with a lawsuit or settlement. If you intend to hire employees, purchase worker's compensation insurance. Lease commercial real space large enough to accommodate computer stations, lounge areas, inventory storage and counter space for cash registers. Local commercial real estate agents can help you find available locations. Determine how many computer stations to create. Purchase equipment such as computers, keyboards, mouse and mouse pads, computer tables and chairs and comfy furniture for lounge areas. Purchase additional computer equipment, such as routers, a main computer to use as a server, computer virus software, computer product licenses (if offering online games to customers), electrical wires and computer cables. Sign up for web-hosting services from a reputable web host provider. Determine what to charge customers for computer use. You may charge by the minute, by the hour or by gaming session. Factor in web hosting and equipment maintenance costs when deciding how much to charge. Create a food and drink menu. Display menu items and prices in an area visible to customers. Determine how much to charge for food and drinks based on ingredients used and preparation time. Create a website to market your cybercafe to tourists, locals and those visiting for business. Hold gaming nights to attract regular customers.